You will Definitely Find your Questions Here! 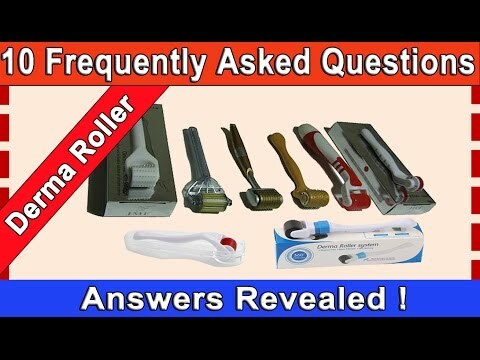 Many people emailed me and asked me questions related to the Youyaner Derma Roller. If you are curious about buying a derma roller and afraid to ask question, then you are most likely going to find your favorite derma roller questions below. 1. My Skin Broke Out After Treatment. Why? 2. How Long to See Results? 3. What Areas of Skin Can be Treated? 4. Which Needle Length to use? 5. How Long Does a Roller Head Last? 6. What Products Should I Use After Rolling? 7. How Paintful is it? 8. Does it Work on Bags Under the Eyes? 9. Can I Wear Makeup/Sunscreen After Treatment? 10. Does it Work on Cellulite, Acne or Milia? 11 Can I use 0.25mm between treatments of 0.5 to 1.0? 12 Is it Necessary to Treat the Entire Face? 13 Can I Roll Upper Eyelids? 14 Can I Use a Roller After Filler Treatment? Question 1. My Skin Broke Out After a Treatment. Why? Do not derma roll if you have active acne. Derma rolling can spread acne bacteria around your face and trigger a breakout. Also, if you have diabetes or cold sores, you can at risk of getting an infection. Question 2. How Long to See Results? Multiple treatments are necessary to achieve significant improvement. Treatment effects are cumulative. Everyone reacts differently so I can’t give a definite time frame. Usually you will see results each week as the skin changes due to collagen re-growth. At least 2 to 6 months of single monthly treatment are required for deep scars and wrinkles. If you have severe skin problem, it is not unusual to see results only after 12 months of treatment with longer roller (0.5mm and above) every 4 to 8 weeks. Some people may even use 0.25mm to boost absorption of topical products between treatments of 0.5mm and above, but this is strictly optional. If you are planning to apply topical product immediately after a rolling session, your topical product MUST NOT contain irritating, toxic and comedogenic ingredients. Question 3. What Areas of Skin Can be Treated? Question 4. How do I Know Which Needle Length to Use? You should NEVER treat keloid scarring with a roller! If you are a beginner, it is EXTREMELY important to AVOID using 1.5 mm or longer needles on your face. They are for body treatment or for professional usage. Use 0.25 mm for boosting the absorption of topical products. Use 0.5 mm for fine lines, mild wrinkles, scarring and sun damage. Use 0.75 mm for mild to moderate wrinkles, scarring, hyperpigmentation marks. Use 1.0 mm for moderate to deep winkles, deep scars, hyperpigmentation marks, stretch marks and chicken pox scars. Important Note: If you are unsure what to use for your scars, you should only stick with 0.5mm. You can still achieve similar results of 0.75 to 1.0mm via 0.5mm roller except you need more treatments. Question 5. How long does a Roller Head Last? Important Note: If you are treating your body, you might need to replace your roller sooner because your body has thicker skin, and it will dull the roller faster. Question 6. What Products Should I Use After Rolling? The best products are vitamin c serum, Retin-A cream, copper peptide serum, vitamin E, hyaluronic acid serum or collagen cream. They help speed up healing and boost collagen production. Important Note: ALL topical products MUST NOT contain irritating, toxic or comedogenic ingredients. For example, hydroquinone, kojic acid, glycolic acid, salicylic acid, TCA acid, Parabens, PABA, etc. Question 7. How Painful is it? This depends on how much pressure you use on the roller. Most people reported mild pricking sensation, but the majority of people have no problem with the pain. If you have very sensitive skin, you can apply numbing cream before treatment. Question 8. Does it Work on the Bags Under the Eyes? Dermarolling will not remove the bags under your eyes, but you can use it to treat wrinkles around your eyes. NEVER use 1.0 mm needles. Use with light pressure only. Do not attempt another treatment until full recovery. Question 9. Can I wear Makeup or Sunscreen After Treatment? DO NOT wear makeup or sunscreen immediately after treatment because they will absorb deeply into your skin through the micro-punctures/micro-channels. These 2 products are not suitable for deep skin treatment. They contain ingredients that can cause irritation or infection. It is best to wait 24 hr for your micro-channels to close up or for your skin to calm down before applying makeup or sunscreen. Question 10. Does it Work on Cellulite, Acne or Milia? Derma roller won’t be 100% effective on cellulite. It breaks down and renews collagen fibers. Cellulite is a fatty tissue. It has nothing to do with collagen. In general, if you have pimples or milia, you should avoid treating the area with pimples/milia until it is cleared up. Using a roller alone can not treat acne or milia, but using it with effective topical product can help improve your results. Dermaroller can help treat acne or milia by increasing the absorption of your topical treatment product without the interference from the epidermis, thus boosting its concentration and efficacy in your skin. Your topical product MUST NOT contain irritating, comedogenic or toxic ingredients because derma rolling can also increase their toxicities in your skin. 0.25 to 0.3mm (NOT 2.5mm) roller is usually recommended. Important Note 1: If you have many pustular pimples, you should really avoid rolling until your skin is fully cleared up. Important Note 2: Using a roller can trigger a breakout because the needles can pick up bacteria from active/pustular pimples or milia, thus spreading them across your face. Instead of rolling into the blemishes, you should roll around them. Question 11. Can I Use 0.25mm Between Treatments of 0.5 to 1.0mm? Many people want to use topical cream or serum between treatments of 0.5 to 1.0mm roller in order to boost results and speed up healing. Since 0.25mm roller is designed for daily or every other day usage, you can use it with your topical product to boost its absorption and efficacy between your treatments of 0.5 to 1.0mm roller. Important Note: Your topical product CAN NOT contain irritating, toxic or comedogenic ingredients because dermarolling can also increase their toxicities in your skin. After your 0.5 to 1.0mm treatment, you should wait several days for your skin to calm down before using 0.25mm roller. This will minimize irritation. Question 12. Is it Necessary to Treat the Entire Face to See Results? It is not necessary to treat the entire face to see results. You can save a lot of time by spot treating problem areas. For example, if you wish to treat wrinkles on your forehead, you can just roll that particular spot on your forehead with wrinkles, and you are done! There is no need to roll the entire face. Question 13. Can I Roll My Upper Eyelids? Your upper eyelids are extremely thin, fragile and sensitive. Therefore, treatment with a roller can cause irritation. Since your eyelids locate above your eyeballs, using a roller of 0.5, 0.75, 1.0 or 1.5 is highly not recommended. If you are planning to use 0.25 (NOT 2.5), then you MUST roll with extreme caution! Excessive treatments can also induce irritation. In my opinion, it is best that you avoid treating your upper eyelids. I doubt rolling can fix drooping or saggin eyelids. Question 14. Can I Use a Roller After a Filler Treatment? Do not use a roller immediately after a filler treatment. Side effects from filler treatment such as swelling, redness, etc., should settle down before consider using a roller. Many professionals recommend waiting at least 2 to 4 weeks before using a roller. Warning: Without proper derma rolling instructions, skin needling can harm your skin . Get step-by-step instructions on 1) how to use and maintain a roller correctly 2) How frequent to derma roll 3) 4 common derma rolling side effects. DO NOT perform skin needling treatment without reading this first! This is the ultimate A-Z guide on dermaroller. Topics include 1) What is skin needling 2) How to use a roller properly 3) What is the best roller 4) Dermaroller reviews. If you want to experience skin improvement by 500%, you MUST READ this! Discover the most reliable place to buy a dermaroller and what to look for in a product. Skin needling is 100% proven to reduce wrinkles, scars and stretch marks. How does it work? Is it suitable for you? How safe is it? Discover the latest facts now! Over 500 Amazon.com shoppers reported experiencing amazing skin improvements for wrinkles, scars and stretch marks. Is derma roller really effective? Discover 7 important details to help you decide. Discover the best dermaroller for under $30 by examining 7 popular rollers and uncover their Pros & Cons now. Will micro needling benefit your skin? These 8 common complaints will help you decide. No more expensive skincare products for scars and wrinkles. Derma roller can improve my skin drastically for under $30! I hope these 13 frequently asked questions will answer your question related to derma roller treatment. Hi I’m interested in purchasing one I’ve seen several videos on U-Tube about the procedures looks easy. I have several wrinkles around the mouth and the 11 lines. And broken capillaries, brown spots from menopause. Other than my is good I’m also a diabetic under control. I already use vitamin C serum very good products. Also is this a titanium roller? Yes, this is titanium. Also, If you are diabetic, you should consult your doctor first before your treatment because your healing process will slow down, and you can get post infection due to your medical problem. You should start out with the smallest roller such as 0.25mm. I am wanting to know if dermarolling is good for skin redness, sum damage and broken capillaries and what is the rule to dermarolling over broken capillaries. I do not know what you mean by skin redness, but dermarolling can cause temporary redness, dryness and peeling. If you have inflammation or sunburn, you should definitely AVOID rolling until your skin is fully recovered. Rolling can treat sun damage, but the result is dependent on the severity of skin condition. IMPORTANT NOTE: If you have irritating or abnormal skin condition, DO NOT ROLL! Also, you should never apply any topical product that has irritating or toxic ingredients immediately after your treatment. I never had broken capillaries so I do not know if skin rolling is effective. It is best that you roll around your broken capillaries to avoid mild and temporary bruising of your skin. I purchased your product on Ebay. I followed your instructions precisely; I started with the head it came with inside the roller box. I believe that’s the 0.75mm. My question is: my skin didn’t bleed and I didn’t see any difference at all. I repeated the treatment 5 1/2 weeks later. I figured maybe I had been too squeamish about the pressure so I pressed a little harder and did it for longer. Same thing, no blood, no result. Hm. Should I change to the 1mm one? Hyaluronic Acid, Vitamin C and Copper peptide serum are not just for immediately application after a dermaroller session. They can also be used all year round. These products are best for boosting collagen growth and healing. Since your micro channels will completely close up after 24 hours, you can apply any topical product afterward because the ingredients can not enter your skin in high concentration, but I highly suggest you use product with healthy ingredients that is non-comedogenic, non-irritating and non-toxic in order to keep your skin as healthy as possible. Personally, I just continue using my vitamin C and A serum. Excellent! Thank you so much for the informative advice! I generally only used the aforementioned a few days after treatment, maybe a week or so, and then I continued with nothing until my next session. I use a 2 mm dermaroller and derma stamp and so far I’ve only done 2 treatments, but haven’t noticed much difference. I do it 8 weeks apart. I’m still optimistic, however. I do not recommend using 2.0 mm derma roller on your face unless you have professional supervision. Using 2.0 mm on mild wrinkles or scarring can make your condition worst because your skin takes longer to recover. Also, your skin will look worst before getting better because 1.5 to 2.0 mm breaks down more collagen, thus causing your wrinkles or scars to sink deeper. If you do not have severe skin condition, you should stick with 0.25, 0.5, 0.75 or 1.0. I’ve been using 1.0 mm derma stamp under my eyes for 4 years now. Typically once a month, sometimes 6 weeks. It’s greatly improved the skin, which was once loose and thin. It’s thicker and taut. It wasn’t super loose and baggy but it was in the beginning stages. Can the 1.0 derma roller close pores? If I were to use the derma roller for hair growth, it says used once a month, can I use an electric messaging brush on my scalp after it healed or just use the derma roller next month? NO, it can not close your pores. You are supposed to use it every 4 to 6 weeks. You can use an electric messaging brush if it is not an invasive treatment. Hi, I have a question. Would my scars be permenently removed after this treatement? Please tell me. My scars are not so deep they aren’t very big either. Yes, the results are permanent. Also, you shouldn’t expect 100% removal of your scars. 0.5 is not for daily treatment. You should only use it once every 4 to 6 week. Also, If you have many pimples on your face, then you shouldn’t use a roller until your skin is cleared up. Yes, slight redness and irritation is very normal. They will go away within 5 to 10 days depending on the aggressiveness of your treatment. Also, you will experience slight flaking of your skin. I have scars at the corners of my mouth, and I am wondering if a dermaroller is safe for this area or if it can help at all. The scars are from my lips being dry and splitting at the corners. I have been taking very good care of my lips since then, but I still have wrinkled dark spots at the corners of my mouth. You really should avoid rolling fragile areas such as the lips, eyelids and the corners of your mouth. Also, you should NEVER use a roller on open sores! I read that you can use Vit C cream, etc. on your skin BEFORE using use the roller as well as after to increase absorption into the skin. Your videos say to use the cream after treatment. Is it beneficial or harmful to use the cream or serum before and after treatment? Thank you. You should apply topical product after the treatment because you want the product to enter the micro channels that was created by rolling. Some people do use it before treatment, but in general your treatment area should be clean or disinfected without anything on it. My aunt accidentaly put my derma roller in the freezer. Can i still use it? Yes you can use it, but you should make sure your roller is rolling properly and not getting stuck. If a good serum, such as one from your plastic surgeons office that has stem cells and peptides in it help boost collagen with the 0.25 needle, since it’s the serum that helps do that? yes it can, but you should always test it on the back of your hand first with rolling. If you don’t get irritation, then it is ok. Also, your topical product should not contain irritating or comedogenic ingredients. Hi, I am 31 year old female having dull skin. I have been suffering from acne since 1999 but now acne are under control for the last 5-6 months. So, I am planning to treat acne scars. They are on my cheeks mostly and i got hyperpigmentation due to chemical peels, microdermabrasion and IPL (Intense Pulse Light) on nose, upper lips as well as on both cheeks. Would dermaroller be helpful to reduce hyperpigmentation and scars. Which size dermaroller would be good to address these problems. It should work,but do not expect a miracle cure! For boosting topical skin care product absorption and efficacy, you can use 0.25. For scar treatment, you can use 0.5 and up. Please note that your skin care product should not contain irritating (chemical peel), comedogenic (pore clogging) and harmful chemicals. If you never use a roller before, 0.25 to 0.5 is all you need. What size would you recommend for the lower stomach region for stretch marks? Also, will this help tighten the lower tummy? With proper diet and exercise of course.. In general, if you never used a roller, you should stick with 0.25 to 0.5, but 0.25 is only for boosting topical skin care product absorption. I am not sure what you mean by tighten lower tummy. If you are talking about decreasing belly fat, then the answer is absolutely NO. How do you dispose of a derma roller? You can just throw it into the trash can. I got a shallow depression on the tip of my nose due to mole removal surgery. It’s a 2 months old scar and it looks little bit pinkish in color, I wanna to know that how old the scar should be to get it treated by derma roller at home. There is no time limit, but you should wait until all redness or irritation disappear before a treatment, and you should start out with the smaller roller such as 0.25 to 0.5) first. You really should avoid rolling sensitive and fragile area such as your lips. For under eye areas, stick with 0.25.